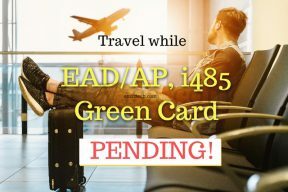 Travel Outside USA while i485 Green Card is pending? Can you travel while I-485 is pending is a common question and the simple answer is NO unless you have any other visa like H1B that can help you re-enter USA. Apply for Advance Parole using USCIS I-131 form to re-enter USA if you do not have any other visa. USCIS denies pending advance parole applications (I-131) if you travel overseas. If you do not have a visa to re-enter USA without AP, USCIS may also deny your pending i-485 AOS (Adjustment of status) application if you leave USA. You can find many forums filled with I-131 denial discussions. Normally, you are allowed to travel while your other visa like L-1, L-2, H1B, H-4, K-3, K-4 or V is still valid and can be used to re-enter USA. But, USCIS can deny your pending i-131 advance parole application irrespective of your visa on your exit from USA. If your Advance Parole is approved, you will receive an I-512 which can be used to re-enter USA. Your can still be denied entry at US airport after inspection by immigration officer. H1B holder should NOT travel outside USA while i485 AOS is pending without getting an approved AP (I-131) if you intend to re-enter using AP. If you plan to return to USA using your valid H1B, then you can safely travel without AP as well. These days, USCIS issues a combo card for both i485 EAD and AP. So, you need to wait for this card to be approved and receive it before travel. If you use AP to re-enter USA, your status on i94 will show as “Parolee” and i94 will be valid on for 1 year. You can ONLY work for the same H1B employer with which you had an H1B approval prior to leaving USA. You can change your i94 status again to H1B by filing H1B extension, Amendment or Transfer after entering on AP. Once H1B is approved, you will get a new i94 with status =”H1B Admitted“. If you plan to re-enter USA using AP and directly want to work for NEW employer (which does not hold your H1B currently) on Day 1, then you need to use your i485 EAD. Note that if you decide to use EAD, you CANNOT return to H1B status again. You cannot file H1B extension, amendment or transfer once you have switched to i485 EAD. If you do not change your status from “Parolee” to “H1B” explicitly by filing H1B extension, your status will automatically be changed to ‘period of authorized stay’ with i485 pending once i94 expires. You will have to use your EAD to keep working if you want. If you returned to US using AP and have not filed H1B yet i.e. your status is still parolee and your i485 is denied, you will be immediately “Out of Status“. To add salt to injury, your time from the day you entered on AP to the date of i485 denial will also be counted as “Unlawful Presence“!! If you changed to H1B after entering on AP, your time will NOT be counted as unlawful presence though on I-485 green card denial. F1 Visa, AP pending, Travel and re-enter using F1 visa? If you are on F1 visa where dual intent (immigrant intent + non-immigrant intent) is not allowed, we suggest to NOT travel unless your AP is approved. You may be denied re-entry to US at port of entry based on your valid F1 visa since you showed an immigrant intent by filing i485 application. This is highly dependent on the immigration officer you see but is a high risk proposition. My former H1B visa was expired last year, and my wife and I submitted our I-140 & I-485 concurrently within the 60-day grace period (i.e., we merely rely on this pending 485 status to stay in the US since then). Recently I got an offer in a university, and the school applied for my new H1B visa instead of waiting for the EAD to ensure that I can begin to work in this summer. Since my former H1B has expired and my school cannot change my status in the US at all, I’ve been instructed to go with consular processing option (after hearing the outcome back from the USCIS) which requires me leaving for my country, getting the new H1B visa interview done, and re-admitting the US. I’m pretty sure that I’ll re-admit the US this summer as an H1B visa holder, but my question is: “Will my pending I-485 application be denied given that I traveled prior to receiving my AP”? My lawyer cannot even give me a confirmed answer and some of my friends said that both my wife’s and my 485 applications will not be affected since I will re-admit the US with a valid H1B visa. Please help, and I look forward to hearing your suggestion & story. Hello, thanks for these valuable information posted on here. I have a EB3 combo card EAD/Advance parole and I also have TPS with valid EAD. I received a letter of administrative closure on my I-485. I’m out of the country and in need to get back in. My AP based eb3 will be expired in exactly 10 days. Is it still valid with the admin closure in the I-485? Will I be able to use it to re-enter the US before it expires? Will I be able to apply for an AP using my TPS status while I’m out??? I will check and reply. Give me some time. HI , we have EAD and our priority date is EB2- July ,2009 and we are with same employer since 2008. can we degrade Eb2- Eb3? is this the right thing to do right now in the current situation if we want to proceed to degrade? Assuming you are from EB2 India, you can wait until your July 2009 actually gets current in EB3 India final action date chart. My suggestion is to wait. I recently obtained a combination card of EAD and AP, and am currently in the process of Green card application (family-based). My wife and I are planning to take a break from work (quitting) and decided to spend a month in my home country. Would this (not having a job) be a problem when re-entrying the United States? Re-entring should not be a problem as you have AP which is based on family based application. Asking this question again in right forum. I have pending i485/i140 and having EAD/AP. I did the H1B transfer to new employer before 180 days and still maintaining H1B status. I will use the AC21 after 180 days to move my i485 to new employer. My H1B is valid for next 3 years. If I visit India and come by AP (approved from my previous employment) and still working for my new employer with same H1B when I left US. If I get my i94 as parole status and my I485 rejected after 1 year, then what would be the status. Is it still in H1B or out of status as my I94 says Parole? Please note as I have 3 year H1B , there is no amendendment/extension during that period. so my I94 will be still Parole status. When you enter US using AP, you only get i94 for 1 year. You will need to apply for H1B extension before your i94 expires to make sure you change to H1B status. If you do not change to H1B status explicitly, your status will automatically be changed to authorized stay with i485 pending after i94 expires. If your i485 is denied anytime before you change over to H1B status, you will be ‘Out of status’ immediately. In case if I have H1B expiry date uptil next 2 year and if I entered in AP, there is no way to do H1B extension until 1.5 years. so uptil then I will be in Parole status. is that correct? is there anyway to notify USCIS that I want to go back to USCIS by doing some amendment or something? I think i clearly said that your i94 is going to be ONLY valid for 1 year once you enter using AP. If you do NOT file H1B extension before this i94 expiry, you will automatically move to ‘period of authorized stay’. You will be in Parolee status until the i94 expires.